For small dogs, senior dogs, or pooches struggling with arthritis, jumping into the car, or onto the couch, can be a real challenge. Thankfully, petcare companies have come up with an ingenious solution: dog stairs. These portable steps can give your canine companion a much needed boost, allowing them access to areas they would otherwise find it painful for impossible to reach. Dog steps can be a real lifesaver for sociable pets who want to be by your side at all times, by providing them a safe and effective route to you. Because they’re such a useful piece of kit, it should come as no surprise that petcare suppliers far and wide have stepped up to the plate to produce some. Great as this is, it can certainly make choosing one set a challenge! That’s why we’ve put together this handy buying guide, outlining the top 10 best options on the market right now. Below, you’ll find some common questions about these steps answered, too, so you can rest assured you and your canine companion can use them safely and effectively. Kicking off our list is Solvit, with their sturdy and economical set of pet stairs. Their minimalist styling blends easily with almost any decor, and they’re strong enough to support dogs weighing up to 120 pounds. They come in one piece, meaning there’s no assembly required, and are the perfect height for helping pooches onto couches and beds, or into the car. You can easily fold the steps down for convenient storage, too, so no need to worry that they’ll take up too much space. Built-in safety rails on each side of the stairs ensure your pet climbs safely, and each step is coated with a non-slip surface. On its underside, non-slip feet prevent the stairs from skidding out of place, giving you and your pooch the peace of mind you need to use them with confidence. As well as all this, they’re really easy to clean, thanks to wipe-clean plastic. With their wide and deep stair landings, Pet Gear’s pet steps for dogs are the perfect solution for smaller breeds, from pugs to terriers. Grips on each step, and on the device’s feet, prevent dogs slipping as they climb, and keeps it firmly in place. For your convenience, the tread on each step is removable and machine washable, making it easy to keep in tip top condition for years to come. When these steps arrive, you’ll find them easy to assemble – they can simply be snapped together, without the need for any tools. This mechanism means they can be snapped apart just as easily, for more convenient storage. The next set of pet steps to earn itself a spot on our list is this fuzzy offering by the Dallas Manufacturing Company. These sturdy but lightweight stairs are available in brown and grey, so they’ll fit in nicely with your home’s interior no matter what. They’re also strong enough to support dogs weighing up to 150 pounds, so can accommodate almost any breed. The steps also feature a unique lightweight design, based around strategically placed cardboard inside the steps, which cuts back on weight without compromising on rigidity. A convenient handle located on the back of the steps makes them easy to carry around your home, and a non-skid base keeps them firmly in place wherever you choose to put them. The steps’ cover can be easily removed and put through the washing machine for convenient cleaning. Majestic Pet’s portable steps are the perfect dog steps for beds and other high places. They’re available in six fun colors, each of which features an attractive patterned design – they’ll look more than at home next to your soft furnishings! The steps also feature a cushioned surface, designed to take the weight off your dog’s feet as they step. Foam supports inside the stairs ensures that humans of the household don’t hurt themselves walking into them either. Owners will also love the fact that the cover can be easily removed, and washed in a standard washing machine, making cleaning quick and convenient. They’re designed and manufactured in the USA from upholstery grade fabric, sure to last for many years. Customers say that the steps are a cute and safe way for puppies to climb onto high surfaces. Earning their second spot on our list is Solvit, with their wooden pet stairs for beds, cars, and more. The wooden design is dyed with a rich walnut stain, for a classic look that won’t look out of place in almost any home. The stair dimensions are perfect for small to medium sized pets, who will find them easy to climb thanks to grippy tiles on each landing. The stairs can be easily folded away for convenient storage, while built-in side rails ensure dogs can step with safety and confidence. They can be used straight out of the box, with no assembly required, and don’t slip and slide once in place. Users report that they look great in use, and dogs take to climbing them with ease. 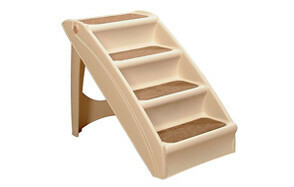 Our next set of pet steps for beds are these foam stairs by Best Pet Supplies. Featuring a soft, fuzzy surface, they’re safe and comfortable for pets of all sizes to use. 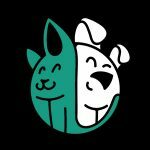 At their core, the steps are made from CertiPUR-US Certified Foam, known for being manufactured in a sustainable way, without any ingredients that could be harmful to pets and owners. The foam is firm enough to take the weight of almost any pet, but soft enough to be easy on paws and joints. On top of this foam sits a soft fabric cover, available in 12 different patterns and colors, from simple beige to funky paw print designs. Whatever your sense of style, you’re sure to find something that blends in with your home decor. As well as being stylish, the cover provides excellent traction for pets attempting to climb, making it a great option for animals who have never used steps before. The fleece cover is also easy to remove and machine washable, too. 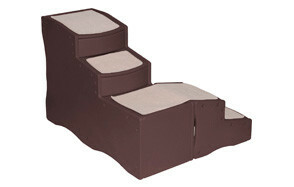 Zinus have also earned themselves a spot in our top 10 with their Step Comfort pet stairs. They’re the ideal dog stairs for high beds, thanks to their availability in five different sizes, which also allow them to accommodate pooches of almost any size or weight. At their core, these stairs feature high density foam; the material is soft enough to relieve pressure on paws and joints, but firm enough to support pets as they climb and descend. Over this foam sits a soft, fleece-like cover, which is easy to remove and safe for the washing machine. No assembly is required, and each set of stairs comes with a one year warranty. The cream color of these stairs mean they blend in easily wherever you choose to place them, too. With their supportive and durable plastic stairs, Paws & Pals have won themselves a spot on our list. The steps are noticeably higher than some others on the market, making them the perfect dog stairs for high beds. The streamlined design comes in one piece and requires no assembly – it also features a calming, neutral color, which allows it to blend in no matter what your home decor is like. The durable design features heavy duty plastic designed to last. Over this sits a soft fleece cover, giving pets plenty of grip and a comfortable climb. This cover is removable, and machine washable too. The steps’ sturdy design can accommodate pets weighing up to 175 pounds, making them a great option whether you own a Yorkie or a Great Dane. 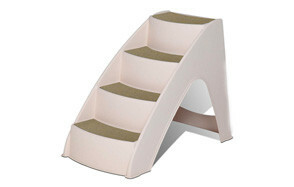 These Pet Gear stairs are the only item on our list to make use of an ‘L’ shaped design. It not only curves naturally around the side of your bed, but also saves room. The steps are constructed from strong but lightweight plastic, they snap together easily for tool-free assembly. Each step features a carpet-style tread to help your pet grip on, while pads on its undersize prevent the device from slipping out of place during use. The stairs are suitable for pets weighing up to 75 pounds, and the large steps are ideal for small and medium sized pooches. The tread covers are easy to remove and machine washable, while the remaining plastic surfaces can simply be wiped down. Users say the stairs are some of the sturdiest around, and that they stay firmly in place when your pet steps on. Filling our final spot is Solvit, with their third entry into our top 10. Their PupStep Lite model is ideal for and medium sized pets, due to its strategically placed treads. The stairs are constructed from lightweight but sturdy plastic – it weighs in at only three pounds, but can support pooches up to 75 pounds. The non-skid feet on the underside of the stairs prevent any slippage or skidding when your dog mounts them. Meanwhile, grippy pads on each tread provides much-needed friction without being harsh on delicate paws. The built-in side rails offer an additional element of safety for pooches as they traverse. The stairs look good, too, boasting an attractive neutral tone that blends in with almost any interior. Because the stairs come in one piece, there’s no assembly required and you can begin to introduce your pet to them right away. And there you have it - these 10 options are the best of the bunch, and we’re confident there’s something on our list for every pet. To help you choose the right steps for your pet, and to get the most out of them, we’ve taken the time to address some common questions and concerns relating to these useful products. With our handy guide, you can rest assured your pet is using their new stairs as safely as possible. Plastic - pet stairs are often made from plastic, with or without a fabric cover. Plastic is strong, reliable, and lightweight. It tends to be the most inexpensive option too. However, because plastic is hard, it’s not as gentle on your pet’s paws and joints, although soft covers can mitigate this. These stairs can often be folded away. Wood - wooden dog stairs offer a classic, attractive look, and great durability. You can expect each tread to be topped with a panel of felt, or carpet to improve grip. Like plastic, wood is quite hard, so dogs might find it less comfortable to climb than other options. It also tends to be less cost-effective than plastic. Like their plastic counterparts, many wooden steps can be folded away for convenient storage. Foam - other dog steps are carved from a type of high density foam, encased in a soft fabric cover. Foam offers the perfect combination of sturdiness and gentleness - it gives a little under your pet’s paws, but isn’t too soft to support their weight. These options can’t be folded away, however, so might not be the best choice for you if space is at a premium in your home. The next factor to consider when purchasing steps for your dog is size. It’s a good idea to measure how far off the ground your car, couch, or bed is, to ensure you choose a product that’s high enough to provide access. The size of your pooch matters too - many manufacturers design their products specifically for larger or smaller animals, so be sure your choice fits the bill for your dog. This is particularly important for larger dogs - be sure you’re purchasing a set of stairs sturdy enough to take the weight of your pet, or you could be in trouble. Most manufacturers will provide weight guidelines for their products, for your peace of mind. When teaching your dog any new skill, taking things gradually and exercising patience is the key to success. Repeat these steps until your dog can happily descend all the way from the top of the steps. Q: How do I know if my dog needs stairs? Q: How do I store dog stairs? A: This will depend on the stairs in question - check the manufacturer’s description carefully for information on a specific model. Many sets of stairs can be folded, reducing the space they take up for compact storage. Others are solid (for instance foam steps), and must be stored as they are. The stairs can be stored almost anywhere in the house, but try to avoid damp areas to keep fabric covers from becoming musky. Q: Why should I use stairs when the dog can jump? A: Even if your dog is capable of jumping up to the bed, couch, or car, you might consider a set of doggie stairs. This is because frequently jumping up can put a lot of strain on their joints; avoiding this kind of activity as much as possible will reduce their risk of developing joint problems over the course of their life. If your dog sleeps on your bed, you might also choose a set of stairs - when they jump up and down, this can disturb your sleep. Providing stairs will make their movements less disturbing! For us, the best dog stairs for beds, couches, cars - anything - are Solvit’s Pup-Step Plus. These stairs feature a simple, neutral design, that will blend in perfectly with your home. They’re made from lightweight and durable plastic, tough enough to accommodate pets weighing up to 120 pounds. The stairs are safe to use, too, thanks to anti-slip pads on its base, safety rails, and grippy carpeting on each step. They can be collapsed for easy storage, and the plastic surface is easy to wipe down. Overall, it’s a budget-friendly and safe solution for pets less able to jump.